We had a lot of fun sharing our craft beer interest with Whitney's parents last year during a 2014 Holiday Beer Tasting. So much fun that we thought it would be a fun annual tradition to start! And thus the 2nd Annual Holiday Beer Tasting commenced. The Holiday Beer Tasting is a sampling of 6 different beers presented with tasting notes and enjoyed at some point over the holidays. This year we did the tasting during the Duke football bowl game which seemed appropriate. 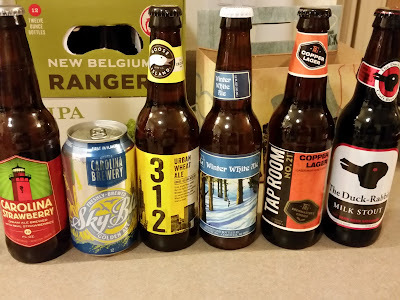 As this was our 2nd Annual Holiday Beer Tasting I had some past experience to guide me in curating this year's selection. What I learned last year was that my parents aren't quite as adventurous beer drinkers as we were expecting and some of my predictions were wrong. For example, last year we had a chocolate stout and a java stout since they love chocolate and coffee but they weren't big hits. Curious to know what we tasted?! I prepared us some tasting notes that contained the type of beer, information about the beer and brewery, and a general description of the style of beer. If you'd like to read over it for this set of beers you can view the google doc here. Even for us seasoned beer drinkers, last year's tasting was pretty adventurous with mostly dark and flavor-heavy beers. Considering the general feedback last year it seems like Whitney went for a lighter, more likely to please assortment of beers. Even so, for me it was nice to try a range of beers outside my normal stouts, IPAs, and occasional lagers. My favorite was the Bell's Winter White Ale, which was a slight surprise for the style, but not for the brewery, with Bell's having several of my favorite beers including their Java Stout and Two Hearted Ale. What an awesome Christmas. I can't wait to see what we'll try next year!